Tony has tried using resources from social service agencies but has never been offered access to job training. The City of Chicago does a regular count of people who are homeless here. The most recent survey puts the count at more than 6,000 people at any given time—though advocates say that at some time over the course of a year more than 100,000 individual people are homeless. Many of them are visible as they sleep in parks or panhandle on the streets. But they’re still mostly invisible and unknown. That changed for me over the past year, as I went out to meet some of the people who ask for money along Chicago’s expressway exit ramps. I learned about their lives, and the “rules of the ramp” they survive by. We&apos;ve included the audio of some of their stories here. I met Bud about a year ago. He used to be a forklift operator in Bolingbrook and after he lost that job, he tried to hold his family’s finances together through various remodeling and temp jobs. He struck me as a very unlikely person to be out here working the ramps in Chicago. He panhandled at the Kennedy exit ramp near Diversey and Keeler. He lived in a sort of mini-tent city under the Kennedy expressway. Bud told me that “rarely a day goes by” when someone didn&apos;t give him two pennies for his efforts. He politely says “thank you” he tells me, laughing. Sort of his way of one-upping them. Some of his fellow ramp workers report that if they get pennies, they throw that “sh—" back at the driver. But Bud said that’s bad strategy. Plus, Bud didn&apos;t want other people in their cars to think he’s ungrateful. I started hearing anecdotes like this about a year ago. That’s when I noticed that there never seems to be more than one panhandler at a time at any given ramp—which seems to suggest a system of some sort. So I started asking if there are rules that govern what happens at the ramps. No one “owns” a spot, and it’s basically “first come, first served” at the ramps. But if you’ve worked there for weeks or months, you have earned “dibs” on that spot. Even if you consider it to be “your” spot, if you’ve earned some money and someone else is waiting – let them on the ramp. Because everyone needs to eat. Don’t walk right up to someone’s car. Don’t ever tap on someone’s car window. Don’t intimidate or harass people. If someone gives you pennies, hold onto it. It all starts to add up. Don’t panhandle in the rain. Drivers don’t want to roll down their windows and get wet. You won’t earn much. Give the ramp a “rest.” If drivers always see panhandlers at a given ramp, they become weary and won’t donate. It’s called “burning up the spot.” Note: This “rule” is contested. Many ramp workers think it’s fine for a ramp to be “staffed” all the time. Asking for money with a sign is not "begging". When you walk up to someone and ask for money with words – that’s "begging". Note: This “rule” is contested too. If you don’t want to be judged—and even pre-judged – don’t work the ramps. 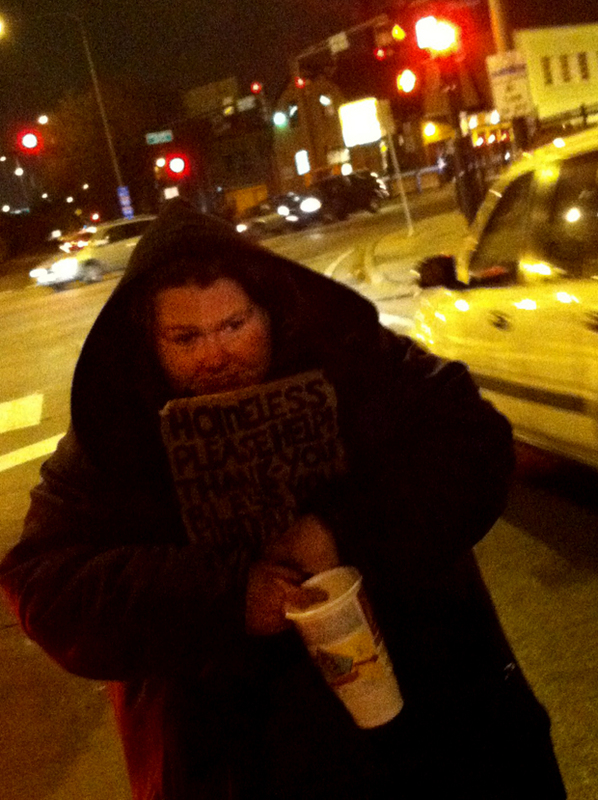 Some experts on homelessness advise the public not to donate to panhandlers. Nonie Brennan is CEO at an organization called All Chicago, Making Homelessness History. She never gives to panhandlers. Last winter I also talked to Jim LoBianco, former head of homeless services in the Daley administration and until recently, executive director at Streetwise, an organization probably best known for the newspaper it publishes and its ubiquitous newspaper vendors. Streetwise is also a full-scale social service agency. LoBianco is also convinced that, in general, donating to panhandlers isn’t a good idea. Though he says sometimes breaks his own rule and donates a sizable amount—$25 or more—if he thinks the person is in real crisis and needs to immediately get off the street. LoBianco says at a shelter, someone who is homeless might get access to other services. But a number of panhandlers told me this is not their experience. Take Tony. He has an associate’s degree in business hospitality and worked for eight years as a sous chef for Marriott Hotels in Detroit, he says. He regularly stays at an emergency shelter and I ask if he’s ever tried to get help from an actual social service agency in Chicago? Okay, social service agencies have not, thus far, found you permanent housing, I told him. But have they ever tried to hook you up with job training — or an actual job? “I ain’t never heard social service say anything about job training. Never.” Tony says. And he asks if the people who told me this know I’m a reporter? “Basically they&apos;re probably telling you what you want to hear. When one of us go up there, it’s something totally different,” he advises me. Dee-Dee panhandles on the expressway ramps too. She&apos;s gone to a social service agency and says she knows very nice people there. She says social service agencies are well-meaning and they’ll put you on a list for help. Many of the ramp workers I talked to acknowledged that there are lots of panhandlers who are mentally ill, strung out on drugs or alcoholics. Or all of the above. And most of them also acknowledged they themselves had a substance abuse problem at some point in their lives. But several insisted that was no longer the case. Now they were simply down on their luck. Were they lying? Probably some were—and some weren’t. But I know this for sure: I met some pretty high-functioning people on the ramps, many who had held jobs and hope to again. 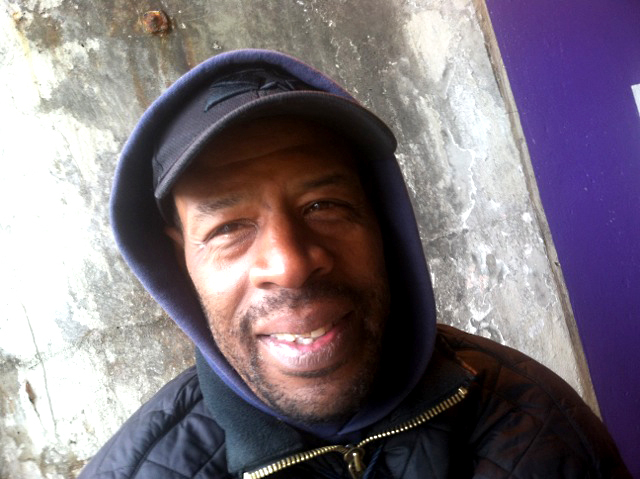 Updated audio for this story reflects new information on Bud&apos;s childhood living alone and sometimes on the streets, not in group homes run by the state. Audio production of Norma, Ed, Bud and Steven&apos;s stories by Ken Davis.